The competition day. I woke up early in the morning without any sleeping trouble, and felt very well. I was ready for the competition. After having breakfast, we went to the contest arena. Nothing really special until the contest started. There was a photo session with the World Champion Cup. However, we were not interested to do that and preferred to relax. Photo was taken by Jillian Hogan, ICPC Digital. We started with one of us typing the template and the other two starts reading the problems. As soon as the one typing the template finished typing, he joined the other two reading the problems. We found that problem C was doable, and one of us starts coding it. The other team member found out that B was easy because some teams got Accepted on it. He took the keyboard when the one solving C was debugging. However, he found that he made a calculation mistake and spent more time than expected to fix it. After submitting B, we got our first Accepted problem, and our first balloon. Problem B: Accepted on the first try in 58 mins. The other team member found that D is doable and starts coding it. He also found that K is doable. However, things did not go smoothly for us both in problem C and D. Fortunately, after a few failed submissions we managed to get our second balloon from problem D.
Problem D: Accepted on the 4-th submissions in 122 mins. Two of us thinking through the other problems. We found that the algorithm for problem I was pretty straight-forward. However, the implementation would be very long. One of us tried to code it, but after few minutes we decided that we should used our time to do the other problem instead. We decided to solve problem K. Earlier, we found that our previous solution for K was wrong. After some thinking, one of us got the dynamic programming idea. After discussing with the other team member, they decided that he should code it while C was being debugged. Soon, C was fixed and we got Accepted for it. Problem C: Accepted on the 8-th submissions in 194 mins. After around ten minutes, we finished K and got our forth balloon. Problem K: Accepted on the second try in 204 mins. While one of us writing the solution for problem K, the other two were discussing problem L. As soon as we got accepted on K, one of the two members doing L took the keyboard and typed. In thirteen minutes, we got L Accepted, and we got our fifth balloon. Problem L: Accepted on the second try in 217 mins. Two of us were delegated for problem E, and our best coder was assigned to implement I with the algorithm that the other member found. However, soon, he realized that we should try the other problem instead of problem I since we only have around 1h30, and doing I was too risky. One of us found that E was doable and started coding it. It seems that problem E needs a lot of optimizations, we got it Accepted when the scoreboard had been freezed, after 12 submissions. Problem E: Accepted on the 12-th submission in 268 mins. We read some other problems while one of us continued to wrote I. In the last 20 minutes, we found that A was doable. One of us coding it while the other helped verifying it. However, we got Wrong Answer. Time was getting shorter and all of us focused on getting A works. Two of us checking the printable code, and the coder debugging in the station. However, we failed to get it right till the very end. The freezed scoreboard showed that we were at 20-th rank, and there were around 8 teams (I don’t really remember) with 6 problems. We knew there should be more teams solved 6. Since our penalty time was really bad, the chance for us to get medals (top 12) was very low. It was pretty sad because we failed to reach our target, getting medals. 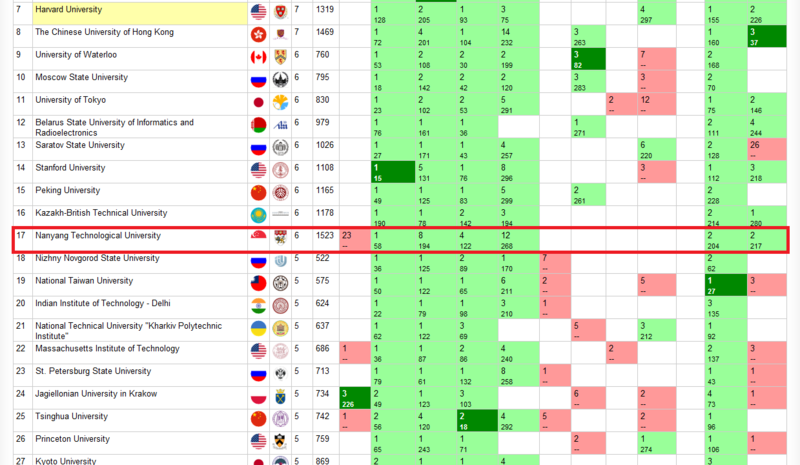 After the real scoreboard was revealed, we got the 17-th rank among the 112 teams. We missed the medals. This is the screenshot of the part of scoreboard that contains us. The full results can be found here: http://icpc.baylor.edu/scoreboard/ or here: http://zibada.ru/finals/. But anyway, we did very well. Top 20 place in World Finals is not something that anyone could get. We also beat many incredibly strong teams. Indeed, this is the best achievement I got so far and I am really grateful and proud to be part of this incredible team.